She is an acoustic six-string songstress extraordinaire with roots in jazz and urban folk. Her latest album, Still Green, contains an original song inspired by the words of American Poet Laureate Kay Ryan. The NY Times describes her as “A virtuoso guitar player and mood-shaper,” while the Boston Globe declares she is “one of the finest self-accompanists anywhere in popular music.” Her humorous but gritty “Wolf at the Door” is a listening essential for any serious unplugged audiophile. It must be the one and only Patty Larkin. 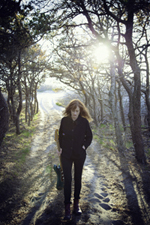 As a singer-songwriter, Larkin often retreats to the shore at Cape Cod for motivation. Perhaps that is where she created the compelling and highly introspective composition “The Best of Intentions,” which can be heard on pattylarkin.com. Larkin is emotionally honest with a tender yet cerebral approach that other artists can only aspire to achieve. Take a listen to “Booth of Glass” from 2011’s Angels Running or “All That Innocence” on 2003’s Red=Luck collection and you will agree that these are two wonderfully warm and perceptive melodies. Iowa-born, Patty became a true Bostonian and humanitarian. She has earned eleven Boston Music Awards and was honored by former Mayor Thomas Menino with “Patty Larkin Appreciation Day” for her philanthropic contributions to non-profit organizations. Music Interview Magazine spoke with Patty Larkin about Still Green, Poet Laureate Kay Ryan, guitar tunings, “Wolf at the Door” and much more. On your current release, Still Green, you were inspired to write the tender “Green Behind the Ears.” A tearjerker, it is based on when you received a book of poems written by the Poet Laureate and Pulitzer Prize-winning author, Kay Ryan. How did you relate what you were going through with the passing of your parents and then your sister’s health issue? Well, “Green Behind the Ears” is Kay Ryan’s poem. It’s her lyric that she gave me permission to put to music. I think the thing that moved me the most was that it was really about watching my kids grow up and how tender their lives are. Really, all of us are in this process of growing, learning and becoming more human. That process can be extremely beautiful and also extremely painful at times. I think when you’re going through it as a kid – you know, I remember the pre-teen and teen “no one has ever felt what I feel” kind of feeling – you’ll also look back thinking how fun it was, say going camping with other kids. For me, it was poignant because I was watching my children go from six, seven and eight to nine, ten, 11 and then 12, while realizing, that part of the human existence, unfortunately, is suffering. How we deal with it and how we overcome it, is perhaps looking at it in a Buddhist way. In terms of my parents and my sister, I think loss of one’s parents, it’s on the program. It’s expected, yet, when it does happen, your whole moon and earth and stars shift a bit. You become the front-end of the group. You realize how quickly it goes. That’s how it tied in for me. It sounds like composing the music for “Green Behind the Ears” was a labor of love. That kind of popped-out. As I was getting ready to write one morning, I was reading Kay’s poetry and began to sing with it. That was the first piece, out of all of them, that I started performing live. It really captures that emotion. It’s a very generous poem. I try to capture that too. There’s that remarkable thing, where I sing it twice. I hoped that she [Kay Ryan] didn’t mind that I repeated it. I found out later, when Kay does live readings, sometimes she’ll say, “I’m gonna’ do this twice.” I thought that was cool. Did you ever meet Kay Ryan? No, I haven’t; just a few emails back and forth. That’s been pretty fabulous. She is very generous and kind to let us use her words, her art and her poetry. It’s world class. She’s really great. I hope to meet her someday. You mention retreating to the Outer Banks on the shore at Cape Cod with an old guitar. Perhaps we can talk about why you felt the sand, the dunes and a tiny secluded shack near the beach, so removed, proved to be creatively productive. I think part of it is that it’s a defined segment of time. You’re out there for a week. There’s a tradition of artists and writers going to those shacks and working out there because there’s a pride about it. A lot of people go there by themselves. I went out there with my family. They left during the day, so I was able to work, which I found was perfect for me. But there is this tradition, this idea of challenging yourself not to be distracted by anything because there is nothing to do. You take a break and maybe go for a walk down to the beach. Then you go back. There is no phone or computer to check. That doesn’t exist much anymore. Strange, but it doesn’t. I was just speaking to someone this morning. She was out swimming. She usually comes to the Cape during the summer. She described being here in January and how isolated she felt. I understand that. It is that way in the winter months, but I kind of like it. I like it for concentration. That’s what the dunes do for me too. You’re out there and there is this big, huge 360 degree landscape. Sometimes it’s too hot, or it’s raining, so you just make tea and you start to write. I really enjoy it. What‘s the story about the guitar which you rescued and refurbished? Well, it wasn’t that much of a refurbishment. We have a town transfer station that used to be a dump. A few years back, they set up a swap shop there. So there’s a little tiny one-room shack where you can leave anything that is useful that someone else might like. There are always those stories about people finding a 335-electric [guitar], or one time, the plumber came by and said, “Patty, you’re not going to believe what I found this morning.” He found a B3 [organ] and a Leslie [speaker]. I thought that was fabulous so when I walked in one day, just poking my head inside, there was an old cardboard guitar case. I thought it was going to be full of mold. I opened it up and there inside was the Harmony Sovereign with magic marker all over the face of it. The bridge was pulled off and just dangling by a string. I thought, oh my God, I used to play jug band music in Oregon when I was in college and that was the guitar the blues players used when they came to town. That’s what a lot of them played. It’s a great instrument, sort of a high-end Harmony acoustic. I brought it to my luthier and he cleaned it up. It’s really got a great neck. It’s one of my favorite guitars to play. You are quite fond of your 1930s steel-bodied National resonator guitar. What’s the model and how long have you owned it? It’s a Duolian, I believe and it’s from the 30s, I think 1935. I got it in Louisville, Kentucky. Louisville’s a really interesting town. It’s a cross of black and white, southern, Appalachian and blues. It almost feels like New Orleans in a way. There are a bunch of great guitar shops there. I went in with my sound guy and I had been looking for a National. They had a couple and I picked this one up there. I like that it’s not totally buffed up and you know there’s a crack in the head, which is okay. Sometimes, about both instruments, I like to sit there and think about who wore the frets down, or how they played it or finger-picked it or whatever they did to scratch it where they scratched it. It’s like an accordion in an antique shop that is really worn. I have one that’s repaired with paper clips. It’s probably from the 1800s. Somebody probably played it for so long that, how did they fix it, where did it wear down? That National thing did it for me. I like seeing the history of the instrument. The New York Times called you “a superb slide guitarist whose mature work is comparable to the best of Bonnie Raitt and Lucinda Williams.” We have to ask, what are your favorite tunings for acoustic slide guitar? I do open-G, open-D. When I write, a lot of times I go into DADGAD, which isn’t so great for slide. I do an open-C tuning with a D on top. That’s kind of fun for slide work. You know, you’re usually looking at standard, or drop-D, just to keep that going. But it’s always a work in progress. When playing slide, what string gauges do you prefer? Do like any particular string brand? I use medium gauge strings. But even on my electric, I use a sort of jazz set so that I don’t have that much tuning, because I’m playing it solo in particular. I’m playing a combination of rhythm and little lead things, so I want to be able to go back there and have the drop-D stay where it’s supposed to. I can’t really stop and re-tune so that I get my solos in. I think the gauge is .13 to .56. What I use is John Pearce. I have, as they say, a relationship with John Pearce. I like the tone, I like the people and they have a new medium phosphor-bronze-80/20 which has a .24 G-string instead of .26. For some reason, it feels better. You get more if you bend the G-string. We could not let this opportunity go by without mentioning “Wolf at the Door.” It is a contemporary six-string classic and an essential for any listening enthusiast. How did you come up with the music? How about the lyrics? I had been doing some touring with Michael Manring, the bass player from Windham Hill. Back in the day, he played with [Michael] Hedges. He was playing solo bass, he’s a fretless bass player and I was listening to him one night doing this funky groove thing that he had set up. I thought how much I liked funk music and how much fun it would be to have something that just sets up a groove on the guitar. I came up with the lick and the chorus and it was like, what the heck is this about? I think I had maybe the first verse. I had that to the point where Michael was out here in my studio, ready to record and we only had the one verse. We just played it and then opened up the second and third verses and came up with a form. After that I had to go back in and write the lyrics and sing it. What I was going for was lyrics that are fun and percussive and playful and tap into the Grimm’s fairy tales. I put the solo in. It was also sort of the early looping, so we used the Lexicon Jam Band that Michael had. He did a lot with vocals. There was a lot of laughing and playtime. I remember laughing a lot. You were honored by Boston’s former Mayor Thomas Menino with “Patty Larkin Appreciation Day” in recognition of your philanthropic contributions to non-profit organizations. Can you tell us a little about what that was like and what organizations you support? That was in the 90s and coincided with an album release date. It was an honor, having someone recognize my artwork and support to non-profits. At that point I had been working with the AIDS Action Committee and the Names Project. The Names Project brought a huge quilt around the country representing victims of the AIDS virus. I was part of the Boston contingent. I had also been working with the non-profit that does whale research; they discovered humpback whales can sing. We did benefits for women’s issues and art centers and continue to do so. I also work with the Beacon Hill Trust helping to raise funds. The fun part about what I do is that I can make a contribution through my live performances. So, once a year, I do something for free in my community. It’s always been a tradition for me. Whenever I can, I do some type of benefit work. I try to help people out with what I do. It’s a plus. Are there any projects on the horizon that you can mention? Yes, you mentioned my guitar and I’m writing for a new instrumental record that will be out in 2015. Part of the promotion for that means teaching at Berklee College where I’m an Artist in Residence. They’ve invited me to do a mini-tour with young women guitarists from Berklee next spring. We’re going to do probably three or four performances on the East Coast. They’ll open the shows. I’ll also do my regular show and some concentrated guitar work. That’s my new project. 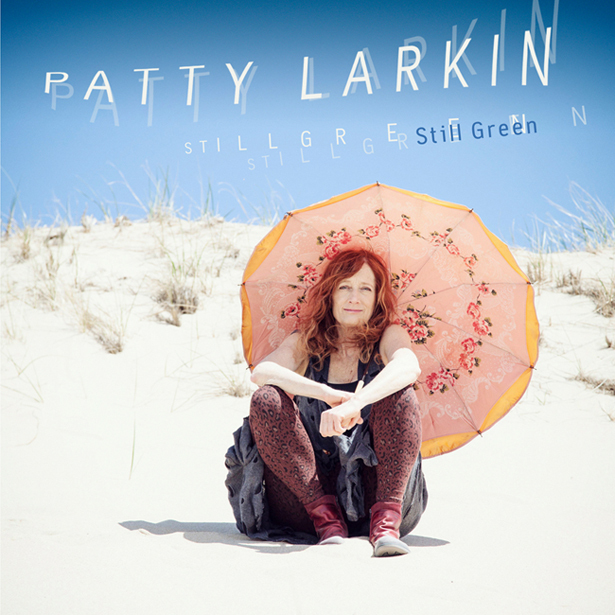 The Patty Larkin discography can be found on Signature Sounds, Bulletproof Artists, Amazon and iTunes.